Stay Right on OCMD Boardwalk! - Beautiful Condo - Rooftop Pool & Gr8 Views! If you like being at the center of it all, this is the place! 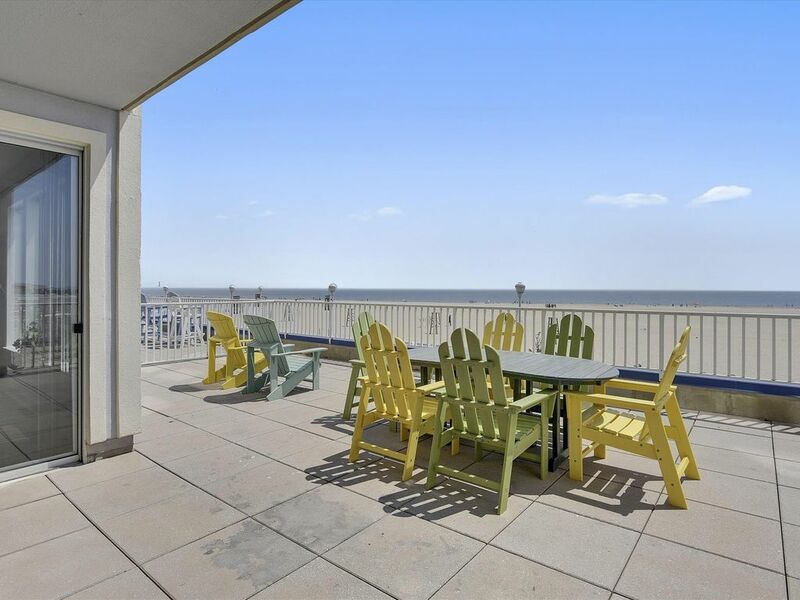 Situated right on the popular Ocean City Boardwalk, Belmont 204 is a 3-BR, 3-BA condo that boasts beautiful views of the Beach, luxurious amenities & a convenient Downtown location. Walk to almost any activity you can think of - amusement parks, shops, bike rentals, miniature golf, restaurants, boating, and much, much more. Once you`ve parked the car (2 assigned spaces in covered, gated garage included), you can just relax & enjoy! Non-smoking. No pets, please. Sorry, NO WI-FI in this unit. Guests can enjoy a beautiful family room with large, wall-mounted flat-screen TV/DVD and sliding glass doors that lead to the 117 SqFt Balcony. Have a seat and relax while enjoying amazing Ocean, Beach & Boardwalk views--stunning at Sunrise! Additional luxuries include flat-screen TVs and DVD players in all Bedrooms, Gas Fireplace, Wet Bar, Soaking Tub in Master BA, and Gourmet Kitchen with granite counter tops, stainless steel appliances & center island. Walk down to the Beach for a day of sun & surf, or stay home to swim in Belmont`s Outdoor Rooftop Pool or putt around on the Rooftop Putting Green. This property DOES NOT offer Internet access. Sorry, no Wi-Fi access in this unit. Amenities: Rooftop Pool and over 11,000 square foot Sun Deck, Rooftop Outdoor Putting Green, 1,400 Square Foot Fitness Center with Lounge, Kid’s Club, Showers, Bathrooms, and….Sauna! BELMONT TOWERS has been called the “Times Square of Ocean City,” a premier downtown destination that brings you closer than ever to all the sights, sounds & smells of a classic beach vacation. Conveniently located on the BOARDWALK and along the ATLANTIC OCEAN, Belmont is in walking distance to hundreds of unique shops, fine restaurants, thrilling attractions & broad spectrum of recreational activities. Stroll to the beach for a day fun in the sand, or stay home to swim in the inviting ROOFTOP POOL, relax on the 11,000-SqFt sun deck, or “putt around” on Ocean City’s only ROOFTOP PUTTING GREEN. Guests have exclusive access to the gated, secure parking garage and a 1,400-SqFt, state-of-the-art Health & Fitness Center, which features an on-site Sauna and the very latest in exercise technology. With its easy location, luxurious amenities, and unparalleled scenic views, Belmont Towers is the resort you��ll keep coming back to.